Komandoo has just the simple elements of a Maldives holiday - and the guests want nothing more. 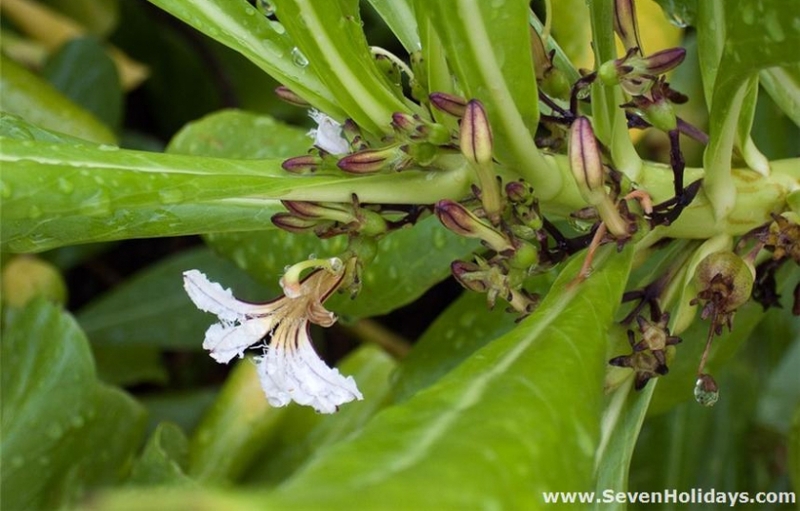 For them, this is one of the islands that offers the ideal mix. It is small, comfortable and quiet; there is no animation and little organised entertainment, but the intimate atmosphere is conducive to mixing and meeting with fellow guests and staff on the same wavelength. 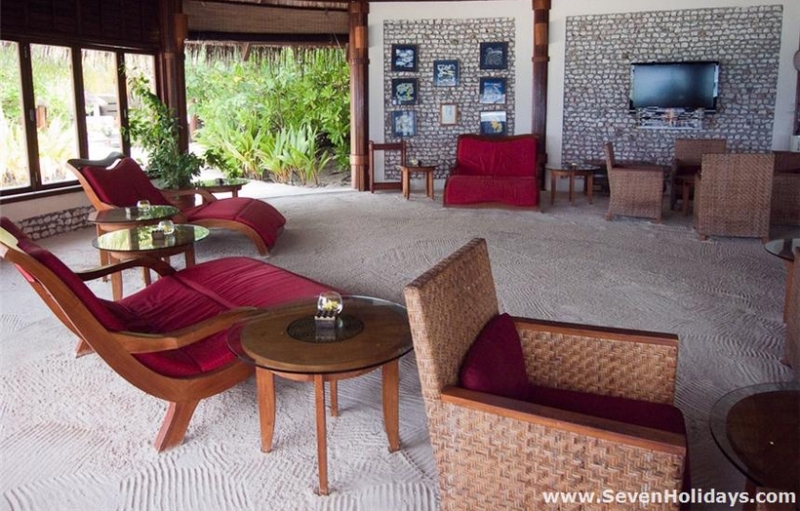 The 65 rooms are essentially the same: 20 Beach Villas, 30 Jacuzzi Beach Villas and 15 Jacuzzi Water Villas. The main difference (apart from the jacuzzi) is whether the rooms face northeast or southwest. The wide southwest beach has sun just about all day but the rooms on the other beach have a more privacy, as the vegetation goes down further and the water comes up closer. The sun leaves the northeast in the afternoon but there is a sunlit view of 2 beautiful desert islands. On the other side, the view is partly obscured by Hinnavaru, an inhabited island. Low walls in the lagoon run around the island, which is disappointing, but they are soon out of mind, and at high tide many are also out of sight. The beach goes almost all around the island and is wonderful. The rooms have steps directly onto the sand, except for a couple in one corner, where the steps go into the water. 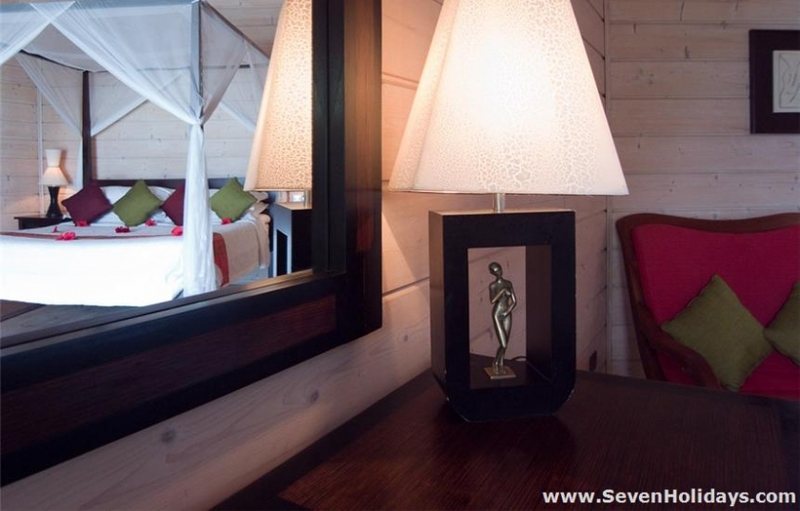 Constructed in Finnish pine, with unfussy matt black and deep brown furniture, the rooms have a Scandinavian feel. They are warm, yet full of light. The tv is large but side-on to the bed. There is an iPod music system, a Nespresso machine and complimentary bottles of water. 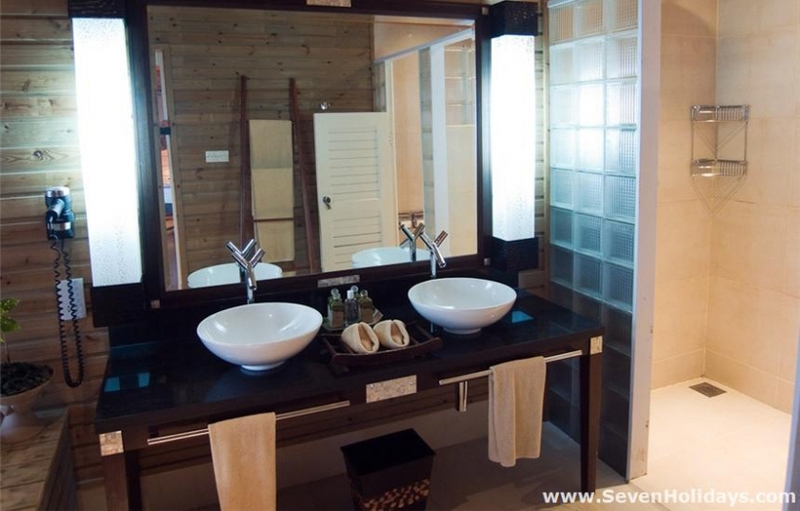 The much newer water villas are in perfect order and their bathrooms are more distinguished than those of the beach villas. From the outside, the beach villas are just beginning to show their age, in this very competitive middle to upper market. The privacy, however, is good as the vegetation is tall and thick between the rooms. 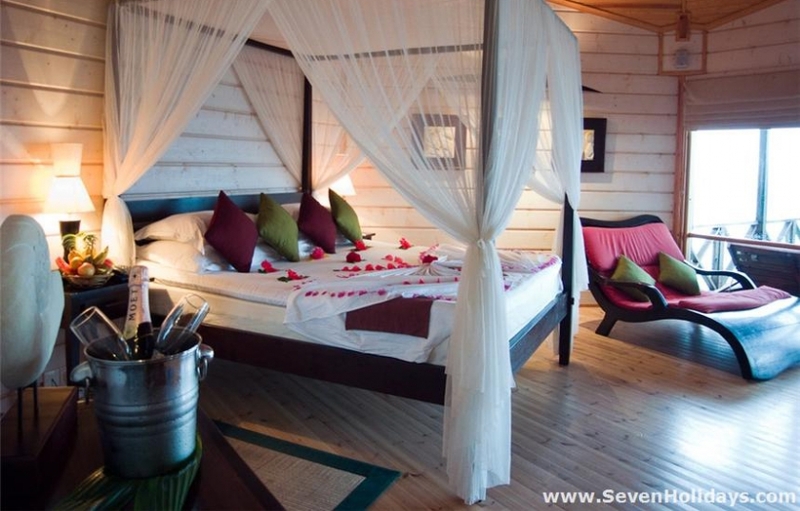 Wooden screens hide the neighbours on the water villa decks. Snorkeling is excellent as the island is ideally sited in a channel. Although the reef edge slopes away rather than drops off and is not among the best for coral, it is a magnet for a wide range of creatures. One marine biologist from Hamburg counted 265 species without ever going for a dive . Manta rays, eagle rays and dolphins are frequent visitors to the reef as they pass on into the atoll. The dive school positively encourages snorkeling, with equipment, lessons and trips out to the nearby wrecks, thilas and caves (on the housereef). 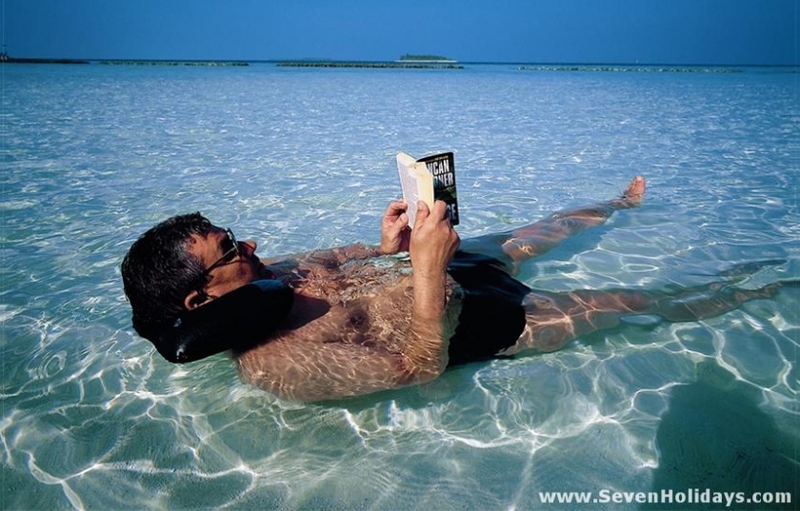 The pleasant and supportive base leaders believe if you come to the Maldives you have to put your head under the water and if one partner is into diving then snorkeling is a fine way for the other partner to pass the time and start to understand the obsession. With a rare concentration of narrow channels one after another, the diving is some of the very best and the most local. There are 15 sites within 15 minutes. 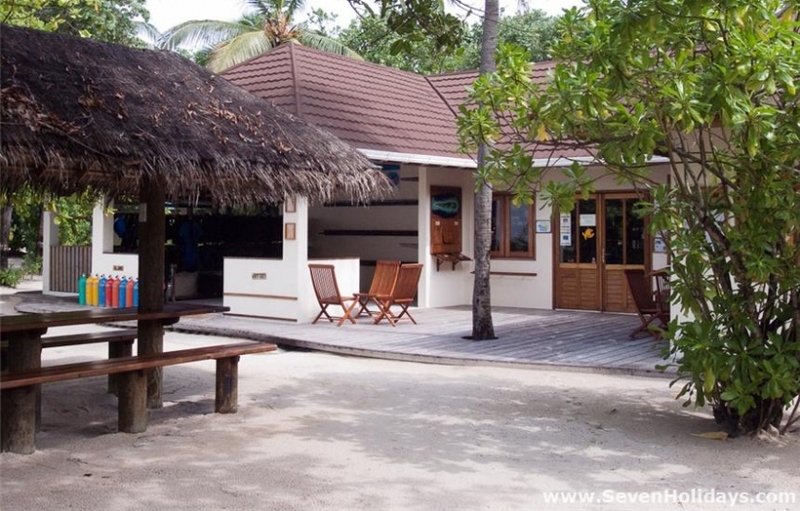 The system at the dive base is as easy as the place itself is open and welcoming. 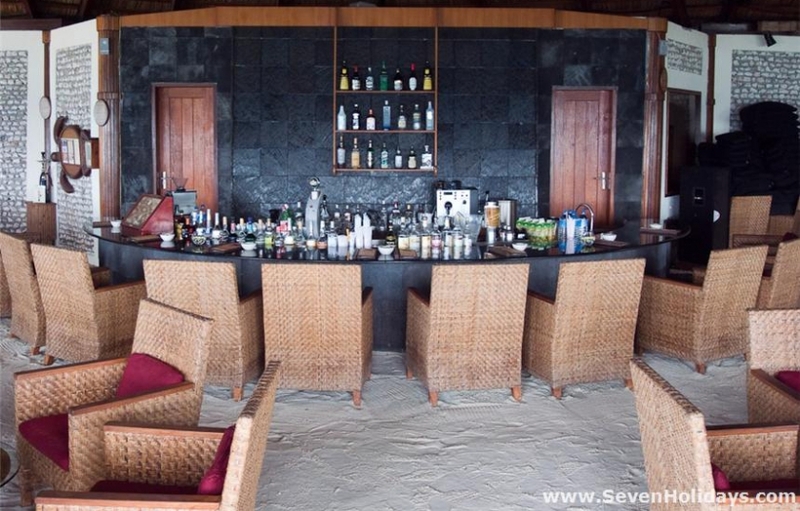 With relatively few guests, the attention is personal, extending to chats in the bar over problems and preferences (as well as reliving the diving highs). The bar is conducive for long, slow evenings, with an atmosphere of ease and camaraderie created by its low-slung cosiness and encouraged by the managers who are, here, the hosts. The restaurant is at its best in the evenings too. Here, the head chef is a second host, explaining dishes, tickling appetites and setting a tone of bonhomie. The food is very good with plenty of flair and variety. 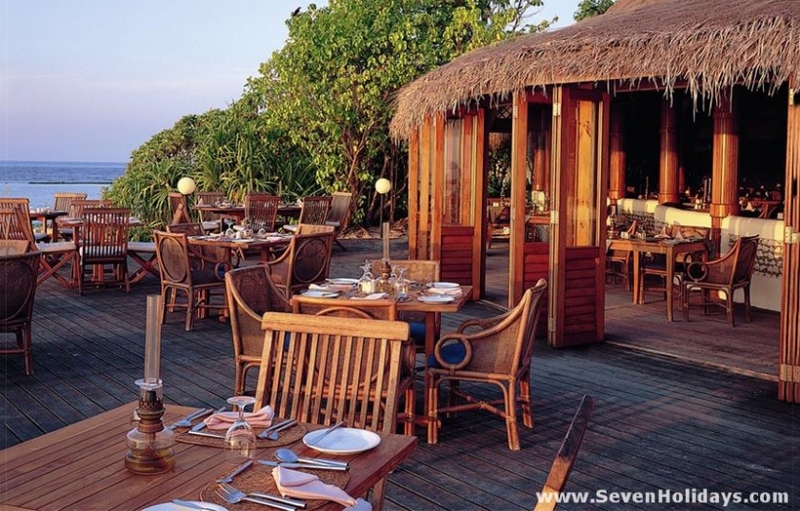 The setting is perfect: sandy floor, lamp-lit tables, a high thatch roof, low coral walls and wooden deck out to the lagoon. One drawback is that the local island, Hinnavaru, is visible (and audible at the calls to prayer). Also lunch and breakfast are just good, rather than great. A new haute cuisine restaurant has been built on the main jetty. The plates here are so beautiful you hesitate to start. Here too the head chef comes out to chat. Between courses surprising ‘amuse bouche’ arrive, such as mango sorbet. As befits the place, there are no boards pushing excursions, entertainments or special dinners, although all the usual trips are offered. Most unusual is a trip combining the atoll capital, Naifaru, with the largest tuna processing/canning plant in the country, Felivaru. Most popular is the weekly trip on the sailing cruiser ‘Britt’. 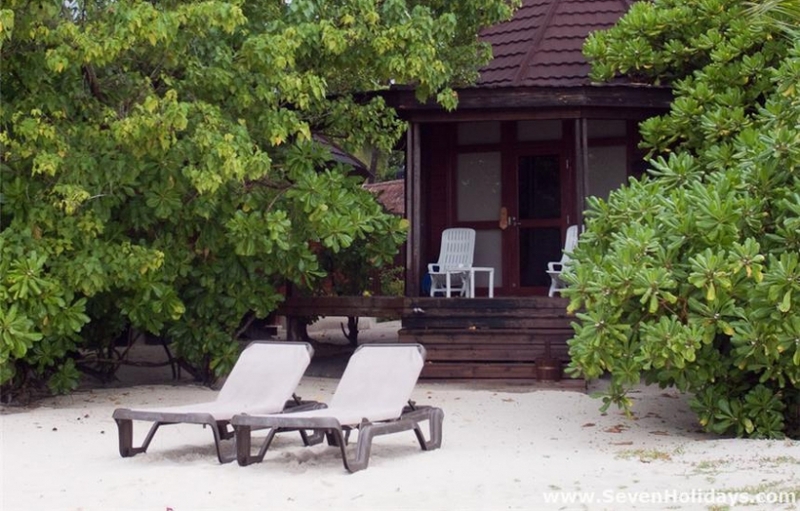 And most private is a launch to Kudadu, a beautiful desert island with excellent snorkeling. Up to 4 people can go, but is usually just one couple alone. 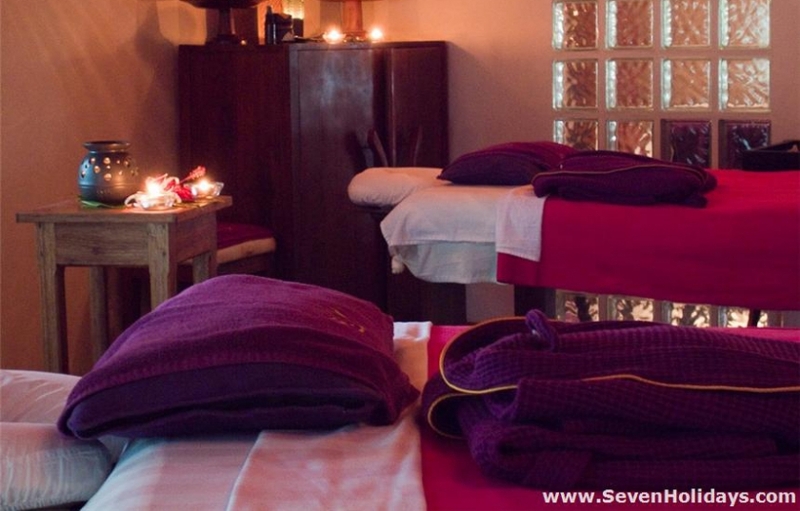 A good spa rounds off the possibilities and that’s it, a perfect place to do very little.